600 years of history. Where to start? With the big picture perhaps. The book pulls together various strands of science so that you get a sense of the significance of certain discoveries and theories. For example, the audacious revelations of Darwin’s ‘Origins’ are all the more remarkable given that the prevailing wisdom regarding Earth’s age in the mid-19th C didn’t allow sufficient time for evolution to have progressed as far as it has. Geological science later developed to yield an Earth-age entirely compatible with evolutionary time-scales; the discovery of plate tectonics provided further supporting proof and our current knowledge of genetics absolutely seals it. There is a wonderful story to tell about human understanding of our existence on a planet orbiting a star within a spiral galaxy and our composition from elements – some of which formed during a supernova explosion. From Ptolemy to Copernicus, Galileo, Newton, Einstein and Hawking, the story of how ideas have changed can help us to understand the ideas themselves. The interaction between the history of science and the history of human development is obvious enough. As we learn about social development, settlement and urbanisation, the technology of communication and transport; the development of medicine and healthcare and the quest for sources of energy that meet demand, we are gradually building up a complex multi-strand timeline of interacting themes. These themes sit alongside, and interact with the parallel timelines relating to politics, revolutions, monarchies, empires, wars and individual acts of courage or foolishness. In turn, all of these themes interact with the development of culture – music, literature, language and philosophy. In some ways, the whole of the curriculum is one giant timeline. In English and Music, the historical reference frame is essential to understanding the development of the art form. In literature, it’s vital to the understanding of a text to know about the time in which it was written. Students should be able to place Beowulf, The Canterbury Tales, Twelfth Night, Frankenstein, Wuthering Heights, The Great Gatsby and Animal Farm in sequence, located in their place in social history, if they are to understand all the references and linguistic nuances. Similarly, in music, knowing how the timeline links Bach to Mozart to Beethoven to Tchaikovsky to Stravinsky helps to interpret the music and to understand the development of symphonic music. I’m less clear how chronology influences mathematical thinking but it can certainly enrich the study of maths. I am currently reading Simon Singh’s The Simpsons and Their Mathematical Secrets. I learned here that the symbol π for the circumference-diameter ratio was only introduced and popularised in the 1820s. Previously I’d always imaged that π has some ancient significance as a symbol but that’s not the case. What this means, is that earlier mathematicians would have wrestled with the concept of π and its numerical value in a variety of ways without a shared symbolic language. Simon Singh has added a piece to the giant timeline of my understanding of the world. So many people. But who chooses who we should study? A key question for curriculum designers, not least those responsible for the history curriculum, is deciding what to include. Where to start? A typical English student will encounter some standard topics: The Romans, Ancient Greece, 1066 and all that; The Middle Ages, The Tudors, The Stuarts,The Victorians and then WWI and/or WWII. They may also explore some unifying themes: eg science and technology, church and state, monarchs and elected governments, revolutions and wars, food and clothing, women, children, poverty and so on. The hope is that this matrix of themes and specific areas of study will lead to a rounded view of history in the end. However, one of the difficulties is that these studies are spread over so many school years that it is difficult for students to knit them all together – especially if they only remember what an 8-year-old might remember about the Roman Empire. The central dilemma for planning a history curriculum is to achieve the optimum balance of coverage and depth. 20 years ago I completed a Masters in Development Studies. My final dissertation focused on UN Intervention in Somalia from 1991 to 1993. It was a very focused study of one particular conflict but it required knowledge and understanding of a wide range of other aspects of history. A key resource was the fabulous World Politics since 1945 by Peter Calvocoressi. Understanding Somalia and the UN in 1991 required an understanding of African history, colonialism, post-war American hegemony and the development of the notion of humanitarian intervention. It also required some understanding of neo-Marxist and neo-liberal theories of economic development and their origins. Gunmen hijacking food convoys or shooting down US attack helicopters in Mogadishu were the details in a much bigger picture. 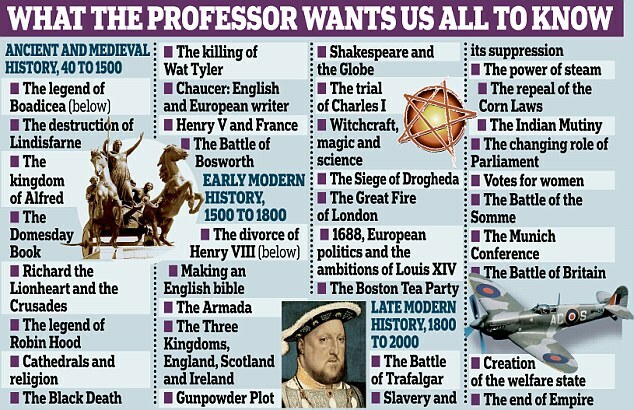 Professor Robert Tombs’ view of history. I know that in the course of the debate around the History National Curriculum, various people have reacted against these prescriptive lists on the basis that they are too narrowly focused on specific cultural perspectives. However, it’s hard to argue with the idea that if most children ended school knowing about most of these events, perhaps amongst many many more, could place them in the right place relative to each other on a timeline and explain their significance then they’d have had a pretty good historical education relevant to someone living in England. Of course, there could be a totally different set of events; it could be more global; more multi-cultural – but any list will reflect the biases of its author. Even here, as presented in the graphic, the list is inherently partial and disjointed. It’s not clear how all the bits fit together. History is so much more than a sequence of isolated people and events. I’d suggest that a macro timeline is the place to start. Even a very detailed study of The Gunpowder Plot isn’t much use if it doesn’t ft into a much wider view of the 1500-1800 era. If chronology was given firm core status in the curriculum, across every relevant subject, and every school child carried around their timeline (a mental model of time supported perhaps by a physical record?!) 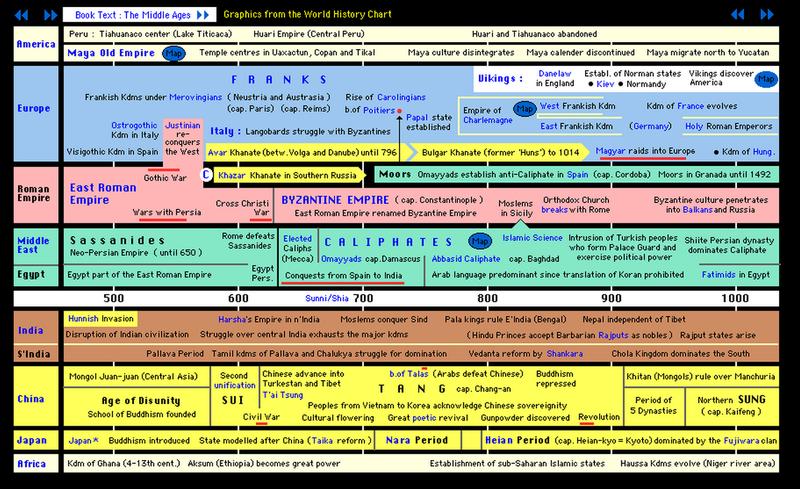 then in every subject they could explicitly refer to their chronology framework and update it continually. So much happened -but it’s still a relatively obscure historical period. Before diving into any individual events or stories of individuals, it is instructive to get a sense of what else was going on. To help recall and retain some of this, perhaps it would be worth learning some key dates; not because knowing dates matters for the sake of knowing; but because knowing the dates helps to structure the framework as a whole. It struck me when reading Martin Robinson’s superb Trivium 21st C, that if we’re going to plan a grammar on which our curriculum is based – the core knowledge that informs our dialectic explorations and rhetorical communication – chronology would be right at the heart of it. I am now discussing this with the Head of History at my school. Do we simply allow the chronology to develop organically over the course of students’ history education or should we make it much more explicit as an over-arching or underpinning aspect of the course? Should we be asking colleagues in science, English, music and elsewhere to be contributing to timeline education in a more concrete, explicit manner? It’s an ongoing discussion. We’re not asking students to prepare for a pub quiz, swotting up some dates to impress their mates. We’re preparing them to create a much more ambitious and complete historical model of everything that could ever fit on a timeline. 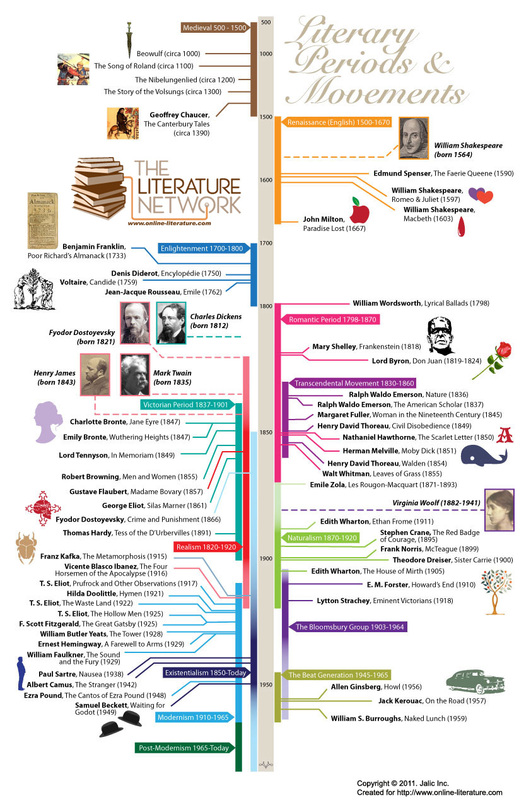 The idea is that every time a student meets a new book or poem, new scientific theory, a new composer or a new historical figure or event, they are encouraged to open up their (metaphorical or physical) master timeline to link it to what they know already,looking at the picture first, then drilling down to the specifics. I agree that a framework for organising learning is an important thing to help recall and understanding. However, when seeking to advance a particular framework, I think it is important to carefully consider what the implications of the framework would be; what are the unintended consequences? (Chronology is one possible framework, but it is possible that different frameworks will suite different learning threads). Yes, I guess that’s the thing. Time is one axis of analysis but it’s a richly rewarding one. This is obvious to Historians but I think other subjects could explore this more explicitly. Timelines are wonderful things. You don’t need to teach chronologically to get an understanding of how things ‘might’ fit together. Timelines in classrooms and post it notes can work wonders… They make some interesting narratives possible & also open debate on cause and effect. A timeline illustrating the history of ‘thought’ would be interesting… I quite like the history of something or other in objects too including the locality in which a school is situated. Thanks Martin. Yes, I agree – the teaching sequence does not have to be chronological. It takes time for students to have the maturity or perspective to make sense of time. ‘Before I was born’ and ‘a long time ago’ gradually expand into decades, centuries and more…the timeline helps with that. We had Kings and Queens of England our our wall as kids – it was a regular reference for tons of other things. One of our maths classrooms is a mini-museum of calculators – its a living timeline. And I’m only the 31st Head of KEGS in 460 years..I’m a living exhibit in the school’s timeline! The second major issue is whose timeline we choose to use. In setting chronology at the heart of teaching we have to make some decision about which story we want to tell. For the history of medicine this is often the story of the triumph of western rational thought and reason. Yet a Marxist might argue that the provision of healthcare was first of all another divide between rich and poor, and later a way of pacifying the proletariat. Are all chronologies equally valid? If so how do we decide which to focus on? Finally, and crucially, I think the love of chronology is something which comes more with age. I have become decidedly more interested in chronology as time has passed. As a 15 year old I had very little real understanding of chronology (and I would argue most people don’t). The big issue of seeing the world in broad context is something I think that comes with maturity and experience. That is not to say that I don’t think chronology should be taught at all, I do, but I also think we have to have patience. It can take decades to build up one’s own narrative chronology of even the British Isles, let alone world history. 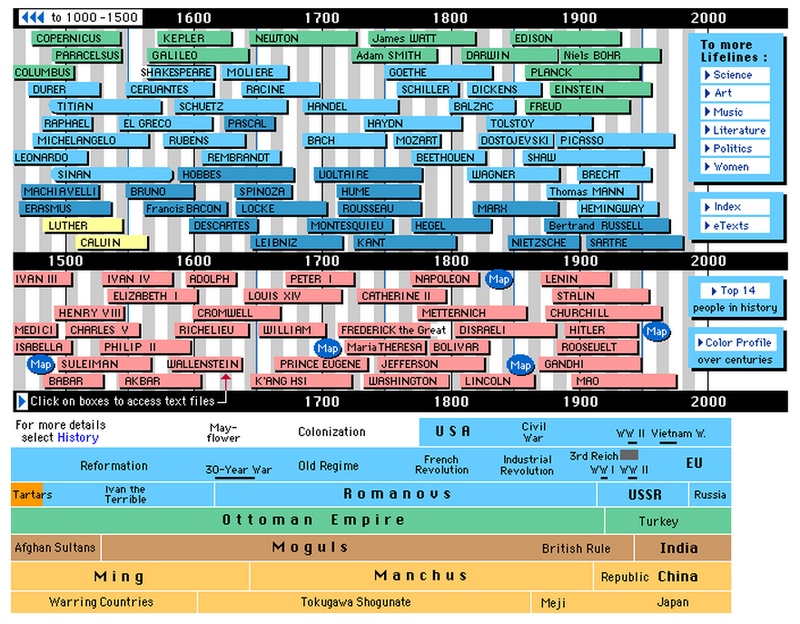 As an example – my chronology of Britain is fairly sound, but when I add in the Mughal Emperors or the Xing Dynasty, I suddenly need to refigure my whole understanding of the chronology I have told myself. We need to be careful we don’t inundate students with too much disparate detail because it tells a chronological story. If we can get them interested in history and their place in the broader sweep of its passing them it is more likely that they will continue to be interested in later life. This surely must be our ultimate goal. Thanks. A really interesting comment. I agree with the maturity aspect. Of course there is a need to allow for different interpretations of historical events, be cautious about causality and bias and so on. We can’t even agree on a definitive view of WWI – but that’s the great thing about school. As long as there is a questioning, enquiring spirit about chronology, it could be a powerful driver. The context of the chronology is an interesting concept. When I was at school WW1 was still very much in living memory, and we had just turned the corner moving away from WW2….. It still very much coloured our understanding of where the UK was at. This is all different now. Thanks, Tom, for some stimulating points. Your Head of History will doubtless be very familiar with the depth and outline arguments which your post raises in relation to timelines and he or she may well have arrived at the necessary compromise position between knowledge acquisition and skills development occupied by most Departments and, indeed, most versions of the National Curriculum. Mr Gove’s last-but-one NC proposal for History was widely criticised by the Historical Association and other respected bodies because it marked a return to the ‘one-damn-thing-after-another’ curriculum of old, and bore too many echoes of the Daily Mail headlines about kids not knowing any dates any more. The same premise too often underpins the kinds of list produced by the likes of Professor Tombs. It’s a meaningless list of events that bear no relation to each other. Pick any one of them and consider how hard it would be to teach it without weeks of necessary contextualisation. Timelines are wonderful things but they can also be tyrannous, daunting, blunt instruments which champion knowledge for its own sake; their deceptive visual appeal often explains nothing. And yet. If we don’t allow timelines to peer at us forbiddingly from the classroom wall like their cousin, the Periodic Table of the Elements, we can shake off their tyranny. Cut them, paste them, scribble on them and cross out bits of them, throw them away and start again. Unless their events relate to each other, as you so crucially say, they are not explaining. If they cannot be used to link periods, people, places and ideas, refine and shape them with Bergeresque intensity until they can. 4 things we do (there should be many more but it’s all work-in-progress). Our English Dept has timelines of a similar type to the one you show above as a book cover on all exercise books. They also teach Yrs 7-9 chronologically. Most English teachers I know are historians in all but name and are fantastic at hooking together text and context. Secondly, we’ve taken some school-based, some national and some international events and put them onto large display boards around our Junior School playground and walkways, providing clear points of historical reference for pupils. Thirdly, our Dept. pendulum has swung back a notch to chronology acquisition , with History exams which require a compulsory fact/chronology element to them. Lastly, we have moments in our History curriculum, and a whole A2 course indeed, specifically looking at elements of significance across and over time ( they are different but linked) and at tests of significance. That raises questions about who constructs the timeline/the curriculum/our map of the past which are free-ranging and hugely intellectually demanding. There is sufficient rigour and stretch-and-challenge there for all students to access. I love the idea of an open, constantly updated school-based timeline where students link new events, people and places to what they already know. I guess that iPads and ICT could be a way forward here, but not the only way. Sorry for the long post – should have been a blog! Thanks for this excellent comment. I like the idea of applying Bergeresque intensity to the whole process you describe. This echoes Martin Robinson’s call for subjecting chronology to dialectic examination. There is a chicken and egg element in practice. Students need a few givens before they rip it all apart and reconstruct it. For example, it is worth knowing where and when the Crimean War took place even if that is all you know. To start with. It’s always great when non-historians conclude that history is the core which knits everything else together! I’d certainly agree that a historical understanding is absolutely critical to full appreciation of most of other subjects. I also share your concerns about the most common curricular approach to Key Stage 3, which often covers the last one thousand years, but misses a good deal of the big picture, geographically and temporally, and is disjointed from other subjects. The idea that teaching chronologically alone deals with this problem is, as you rightly say, nonsense – because we must return to re-study key periods in light of new understanding if we are to truly appreciate them. 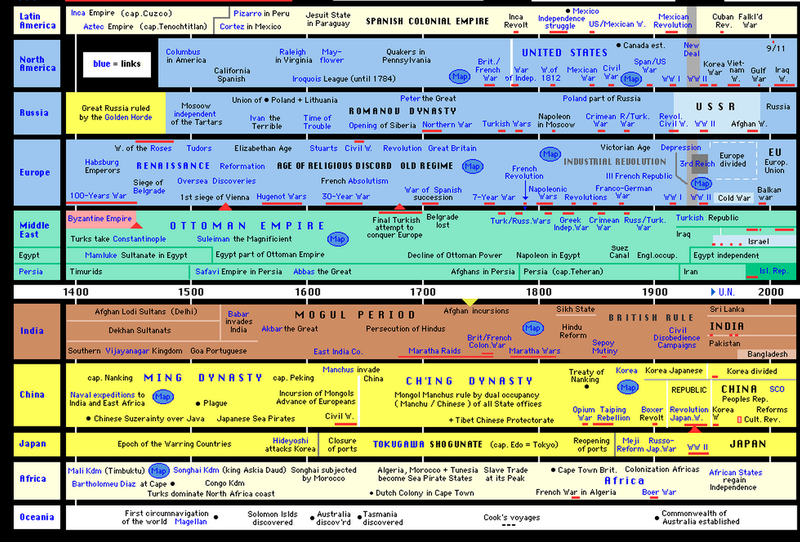 I’ve tried to address this, by creating an introductory unit on chronology for my Year 7s which runs from the Neolithic Revolution to today, and reinforced this with a unit on key eras in British history for Year 8 – with a view to building up this framework – then ‘colouring in’ some of the periods within this overview. I also worked with our maths department to create a history of maths course – and there are some fascinating links – whether in terms of stories (Pythagoras, to Fermat, to Andrew Wiles and Fermat’s Last Theorem) – or in terms of the influence of context on maths (looking at the influences of the turbulent seventeenth century on Isaac Newton has been one recent highlight). Thanks a lot Harry. I’d love to see how your KS3 curriculum compared to ours. Fancy a visit to KEGS to meet me and my history HoD? Could be an interesting discussion. Finishing my post on our history curriculum is a task for this half term – and I’d love to visit KEGS and talk history and curriculum, thank you for the offer – I’ll email you. Thanks for this Tom. I’ve seen timelines used in a variety subjects as both a teaching and an assessment tool. I’ve even used them in Spanish when it’s been appropriate. Like Catcher in the Rye there’s something ominous about the number of copies of Bill Bryson’s book I’ve picked up in charity shops. I can’t help it. Every time I see one. I can’t bear to have them left on the shelf. People will underestimate how well written it is. Having said that, I think I love it because it ties up so many stories that I am already familiar with. I pass my copies on to students all the time. The moment you make it compulsory is the moment it dies in their hands. I do think as you get older you have a finer appreciation of where everything fits. Great post. Great feedback. 1. I loved that Bill Bryson book and was fascinated by it. But it was so full of information that, sadly, I think I’ve only retained about 100th of it. I do remember, though, that the opening chapters made me think how essentially tiny, and insignificant all our achievements and ambitions as a species are. There we were, measuring the mountains with pieces of rope, while the universe spat out whole galaxies in seconds. 2. You’re so true about chronology. In English, it’s virtually impossible (not to mention pointless) to teach a text without first establishing what sort of time period, and thus what sort of culture we’re talking about. It would be difficult, though, to teach texts chronologically, since the oldest are also, in many ways, the most challenging. For me, I’ve long been dead keen on students learning a history of ideas. It doesn’t have to be highly detailed, a summary of each movement’s motifs and outstanding individuals, but enough to give them a skeleton they can hang the rest of their learning on. It disturbs me that students can leave our schools now with virtually no knowledge or understanding of Greek philosophy, scholasticism, the Renaissance, the Enlightenment, Romanticism, Modernism and Postmodernism, and their significance to Western thought. Philosophy is one of key pieces missing from the jigsaw that is the UK education system. A vast reservoir of ideas that can provide a) an intellectual narrative of world history, b) a training ground to develop moral and intellectual virtues, c) the glue that can bind and frame all subjects together, and d) a forum for students to express and challenge one another’s worldviews; preparing them for citizenship in a much deeper sense of the word. You may be interested in the ‘what on earth’ wall books series too, we have them in each room in our department (RS) and find ourselves constantly referring to them to encourage big picture understanding. This is such an interesting post. The issue of chronology has been at the heart of the debate about history teaching for a long time. As Alex says it is complex. Just teaching chronologically doesn’t automatically mean a chronological understanding and the idea of building a frame for the past is one aspect but then the additional issue of contemporaneous chronology is a further challenge. I think a core issue must be a clear and understood rationale for what we choose to teach and, more importantly, what we chose to leave out and the order in which we teach it. There needs to be cross departmental school discussion about this too; as a historian I would not choose to teach the Holocaust before Year 9 if I could, not only because of the relatively modern time period but because of the complex and difficult nature of the subject but my daughters both did The Boy in the Striped Pjamas in year 8 ( a book lots of history teachers have real issues with too!). Ian Dawson is good on strategies for teaching chronology, especially big timeframes, his website is a good place to start……once you have a content framework that is.